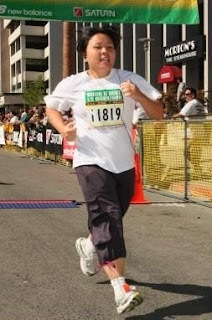 Yesterday I just received the pictures taken of me during the SJ Rock and Roll Half Marathon. 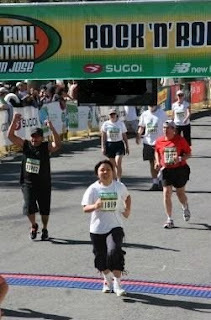 I must say that I'm a lot happier with these photos than I was with the SF Half Marathon. Why? Well, because I don't look constipated in these photos like I do in the last ones. 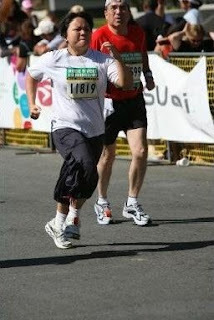 But more specifically, it allowed me an opportunity to see a snapshot of my running form/technique. In these photos, I've managed to relax my shoulders and upper body while running, which is something that I've been consciously trying to improve for my form. I know it sounds backwards, but many elite athletes try to be zen and relaxed while they are competing. It not only improves performance, but also is more efficient for your body. And I know I sound like an obsessed little fan girl right now, but Michael Phelps is a master at relaxing while competing and look where that got him. In any case, even though I'm not trying to be an elite athlete, I would still like to be performing at my best and have minimal pain after a workout. These pictures show that I am truly "running tall" towards the finish line as opposed to my SF Marathon photos where my shoulders were scrunched up to my cheeks. I'll take this small victory as the one saving grace from this race. Now all I have to do is work on my game face, because I think I look a little too angry. =) heh, possibly not. considering that it'd be SWELTERING and I'd be grouchy about that heat. You look like such a hard-core athlete! Like you're running really hard, but it's still elegant. These pics have convinced me that form actually matters, and maybe now I will look into it more.